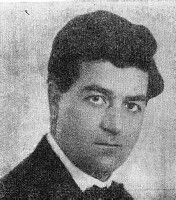 The tenor, Atanas Ivanov, was born 30 April 1895 in Nova Zagora. In 1918 he graduated from the Music School in Sofia as a student of Anna Todorova. In 1919 he began private lessons with Ivan Voulpe and worked with the Bulgarska Operna Drushba. Between 1928-29 he continued his studies in Milan with Borgi, Cotoni and Pertile. His debut was as Hoffman in the Tales of Hoffman in 1923 with the Sofia Opera. After international appearances he returned to Bulgaria 1930 and performed until an illness in 1932 forced him to leave the stage. After a lengthy absence he returned to the Sofia Opera in 1952 for his second debut as Alfredo in Traviata. Ivanov was a representative of the Italian bel canto tradition in Bulgaria. In 1957 he became a concert performer, soloist and second conductor with the Alexander Nevski Cathedral Choir. Major roles in his career included Radames, Cavaradossi, Nadir in the Pearl Fishers and many of the tenor roles in the Bulgarian opera literature. Atanas Ivanov died on December 19, 1961.